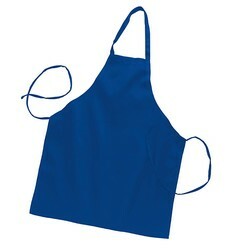 The full length apron has a plain front, generous cut, self-fabric neck strap, extra-long waist ties can wrap around and tie in front. Imprint Size: 14" x 14"
VERY IMPORTANT: Due to the manufacturing process, variance in size and dye lot may occur in this product. The inventory is constantly changing, please confirm availability before sending in Purchase Order. Turn Time: Blank Product - If stock available, 1 day + days in transit. Screen Printing - if stock available 4-8 days + transit time. Pricing published are for blank products. See our BamBams website, screen printing link for additional cost and information.